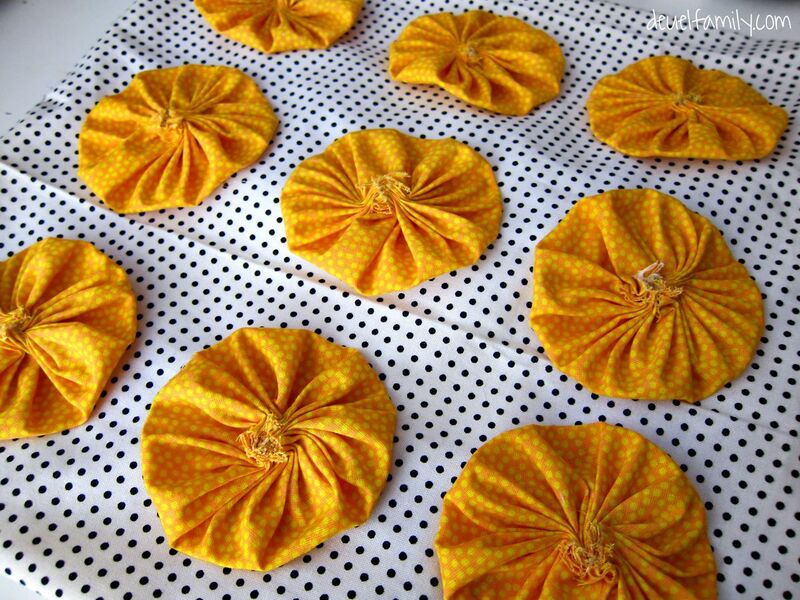 This week’s Friday Spotlight item is an envelope close pillow case decorated with yo-yo flowers. **Psssst: Announcement teaser at the end of this post! 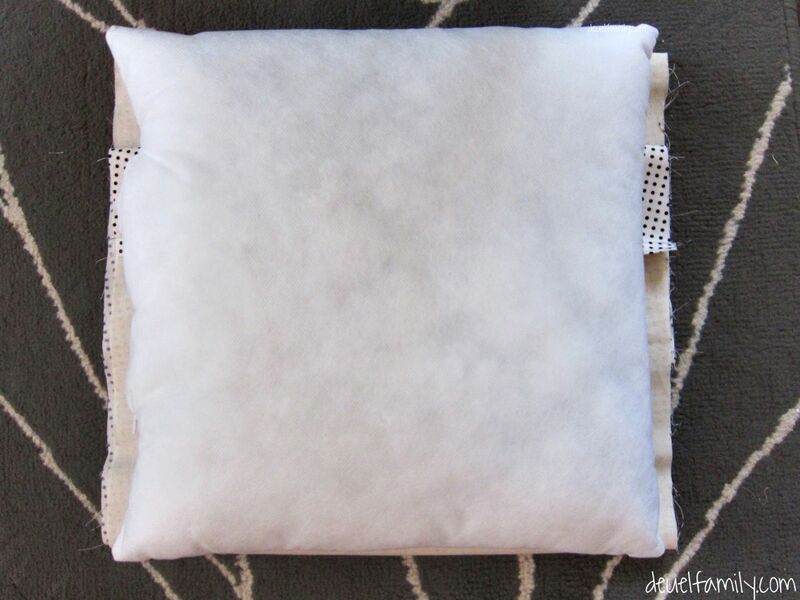 Do you remember this pillow that was all over the web over a year ago and sold at Target? I loved it, but never bought one. I really wanted it for a bed that I had in my head. My imaginary new quilt. 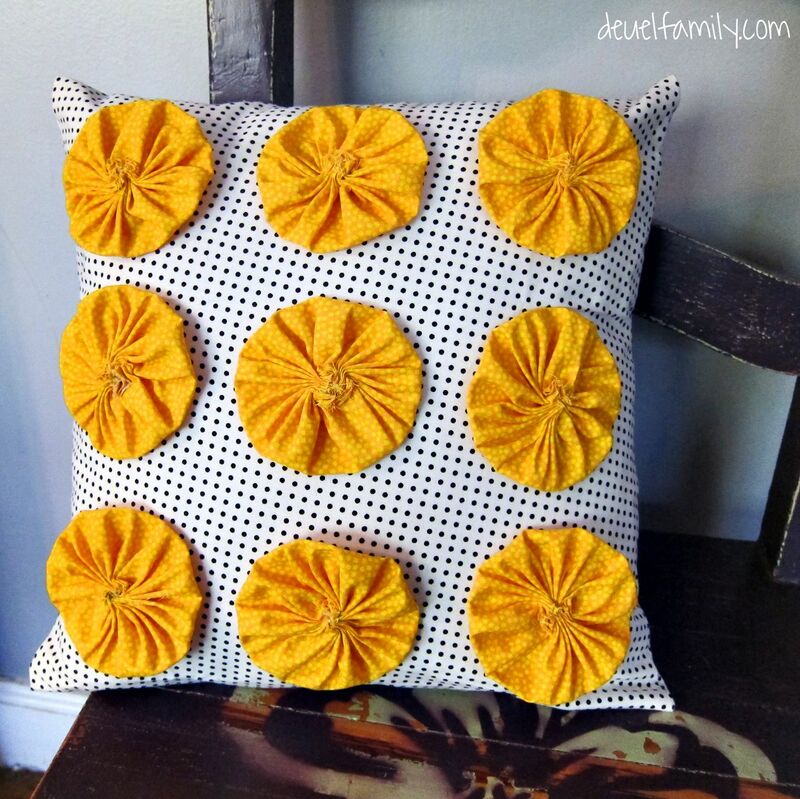 Now that my quilt is finished and my room has been coming together, it was finally time to start making those decorative pillows like all the ones I love at Target. My pillow is obviously not the same, but I used the same “idea” and “contrast of colors” to create mine. 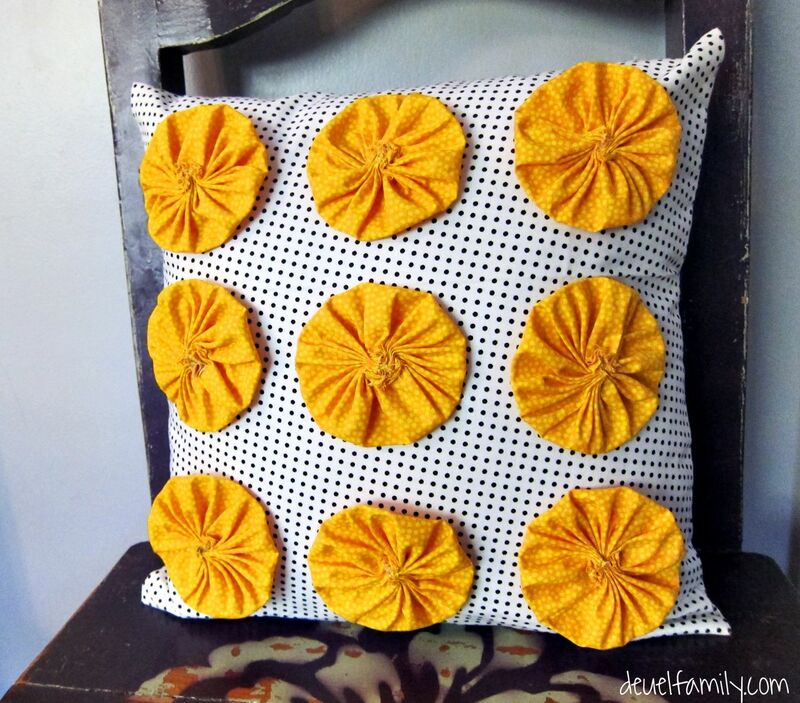 I am going to show you step by step how I created this pillow. Let me warn you there are tons of pictures, and it is really descriptive! 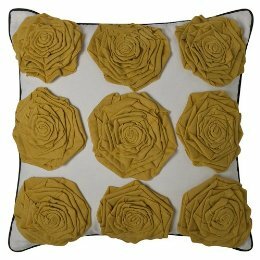 I hope it helps you, so you can make this pillow too! Let’s start with how to make the yo-yos. I made twelve yo-yos, but only used nine on this pillow. Here is how you make that first one. 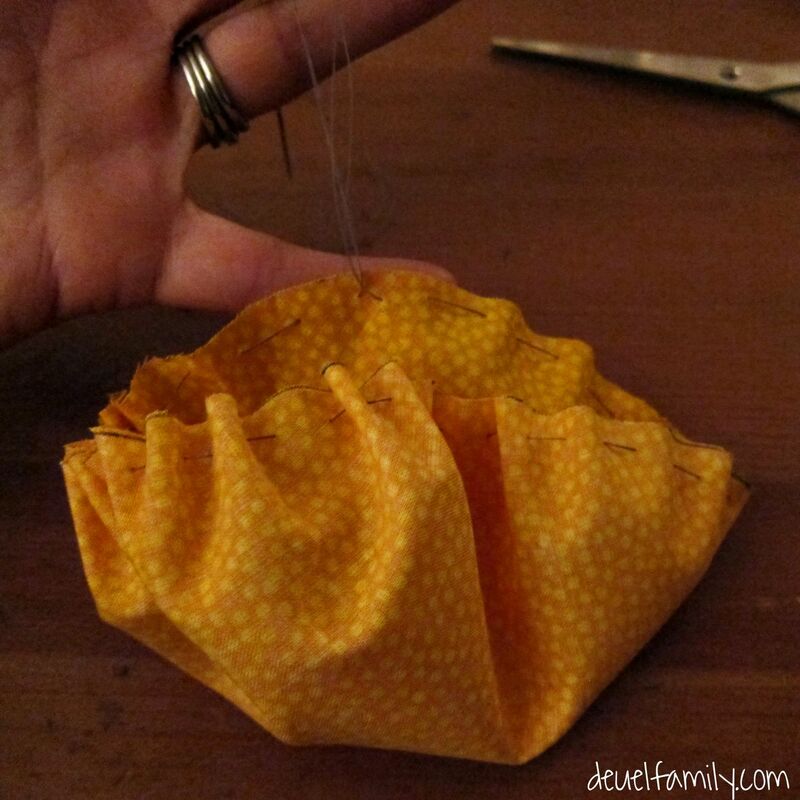 Get your fabric, scissors, pen, thread, needle and a bowl to start. 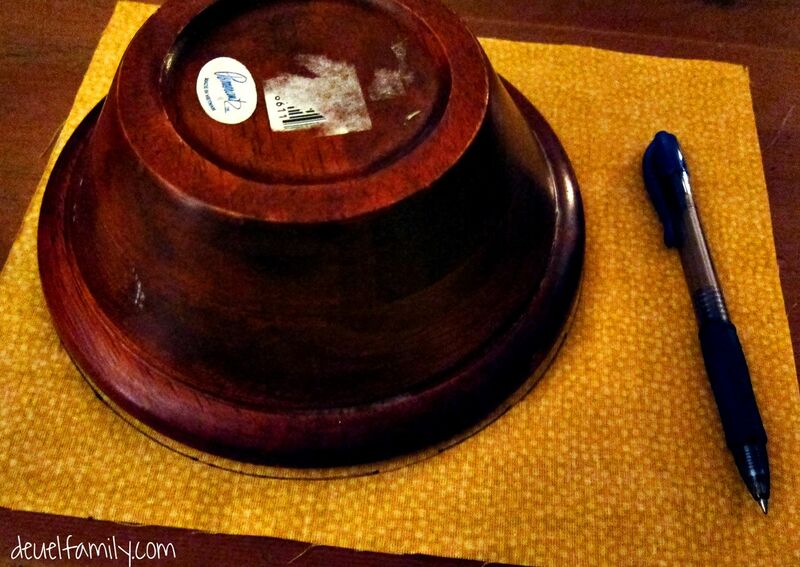 Trace the bowl onto the fabric. The bowl allows your circle to be perfect. Use what ever size bowl or cup you want. Just remember they will “shrink” up through this process. I used a salad bowl. 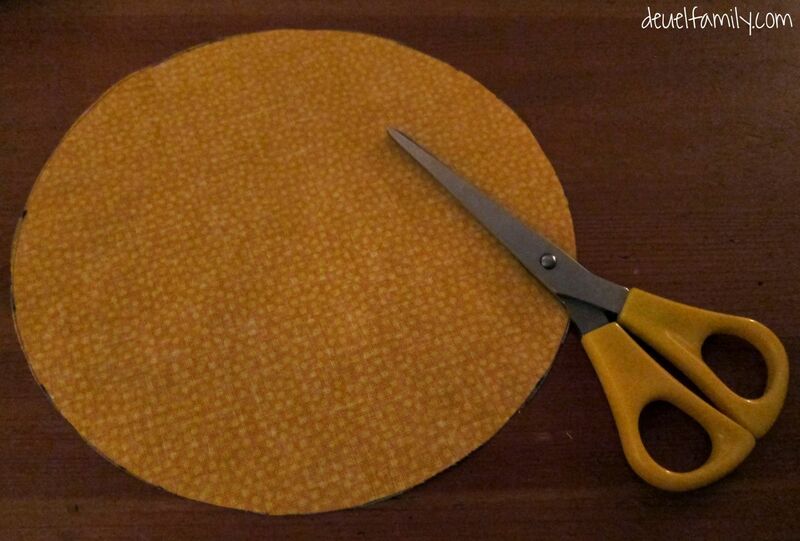 Once you have your circle on the fabric, cut it out. Thread a needle. There is no need to tie a knot at the end of the thread. 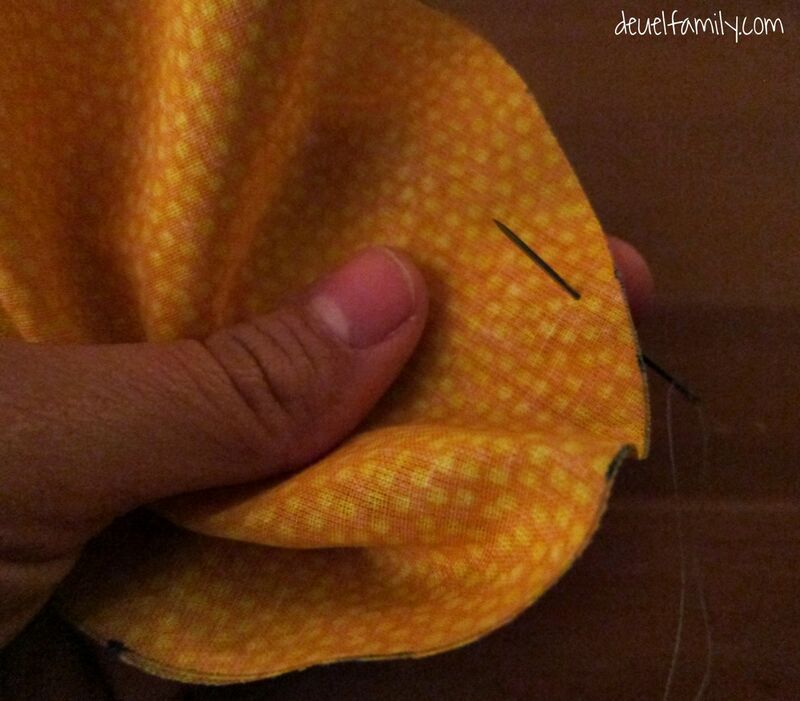 You will start to weave the needle into the fabric about a centimeter from the fabric’s edge. 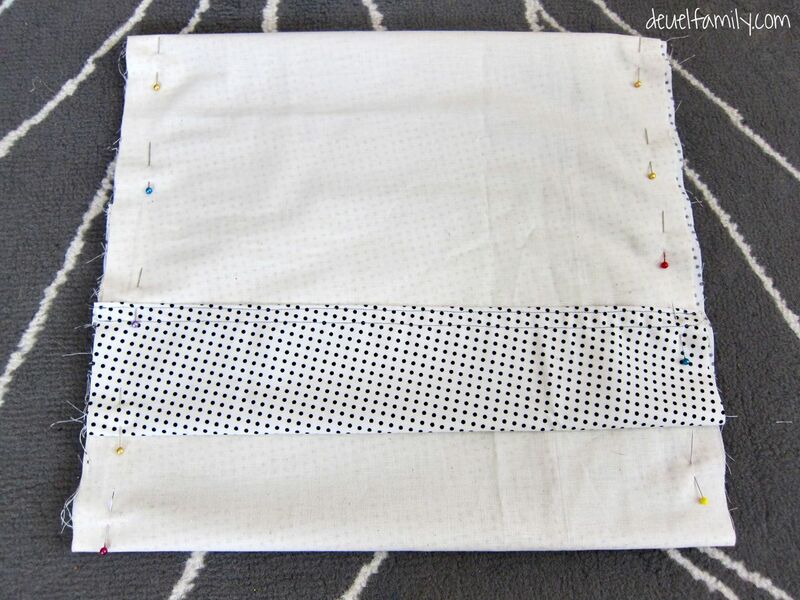 As you weave make sure you have at least three inches of thread sticking out from the start. 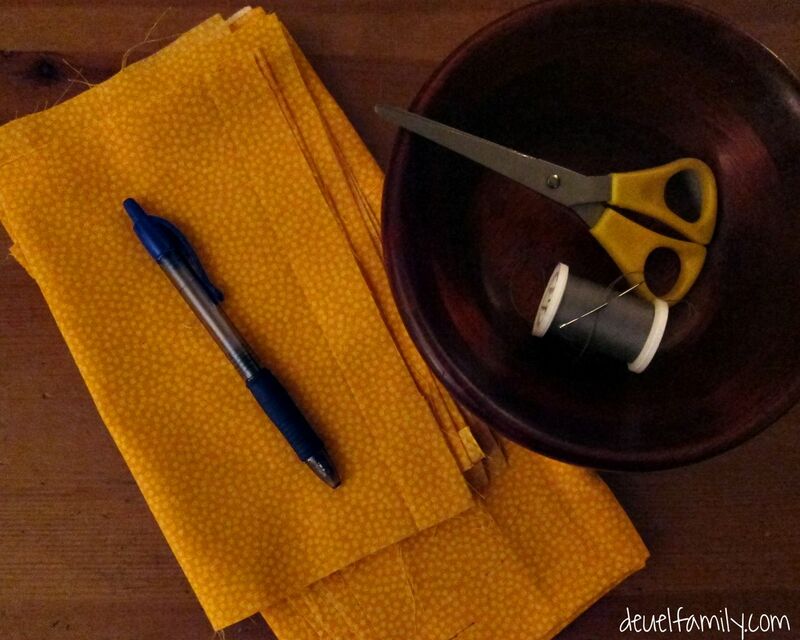 Tip: Use the same color thread as your fabric. Continue weaving all around the circle until you are back to where you started. Do not stress about the distance of each stitch. It wont matter! Promise! Once your weaving gets back to the start, grab both ends of the thread in one hand. 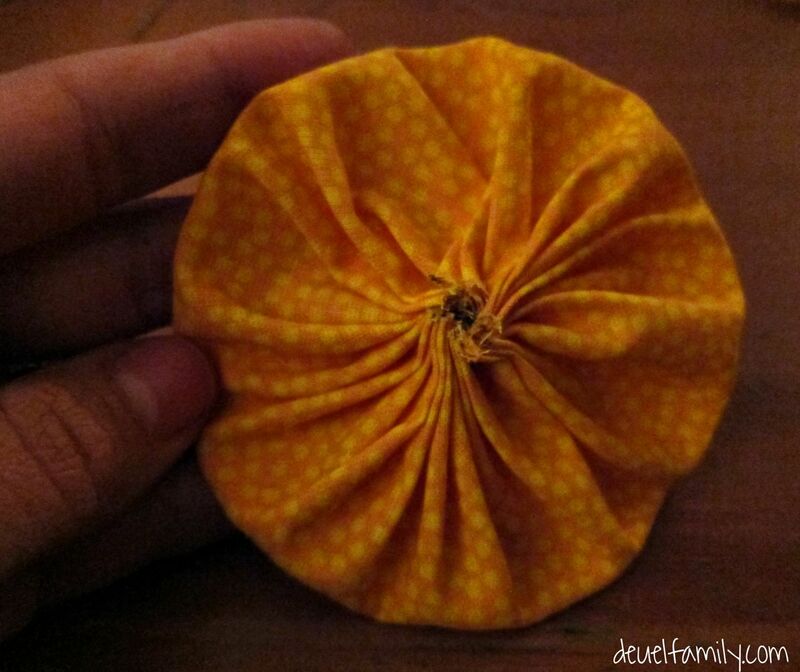 Tie the ends together to form a tight knot, and then pull out the fabric’s edges to make the flower flat. It’s just that simple! You have a Yo-Yo flower! Now to only make eight more for the pillow case! Use your yo yo for a pillow embellishment like this, or you can add a button in the middle and a clip to the back to make a hair bow! Now for the second part of this pillow, the actual pillow! I think the yo-yo step is harder. No joke. 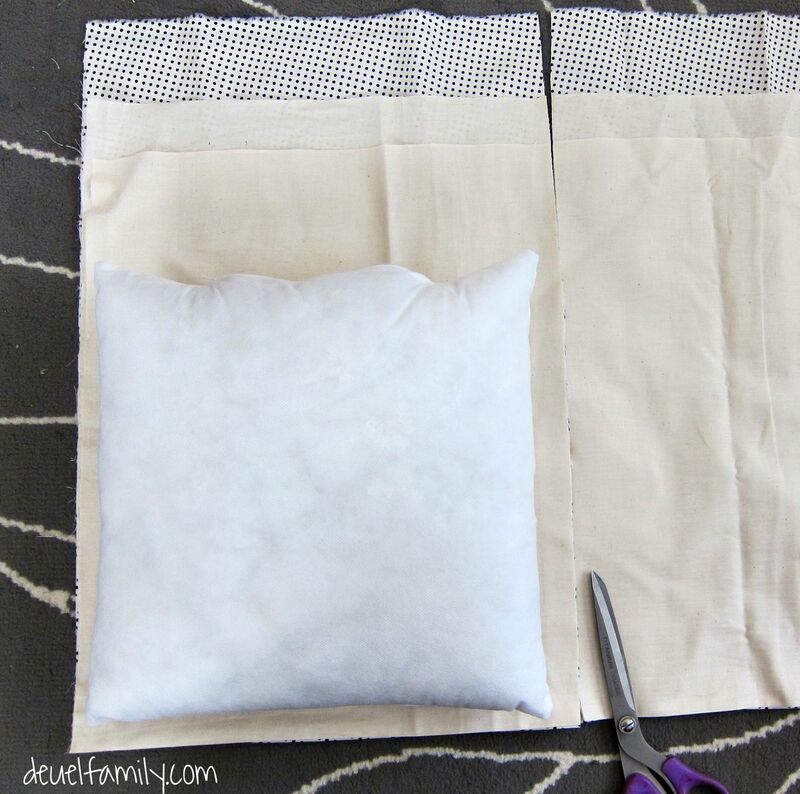 Once you figure out how to do the actual pillow case, it is so quick to make! Here we go with these steps! 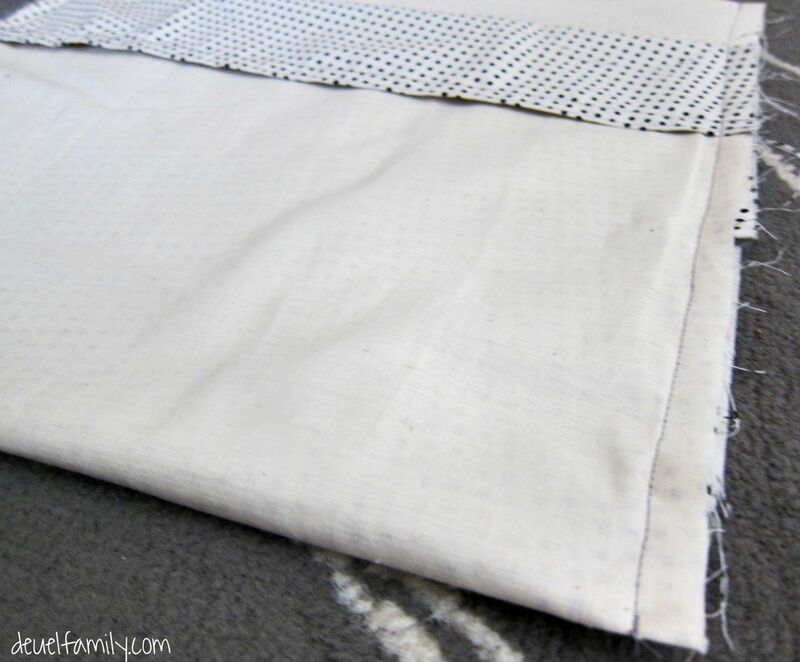 I lined my pillow case with a creme fabric to add strength and durability to the pillowcase. Lay your outside fabric face down and your liner fabric on top. 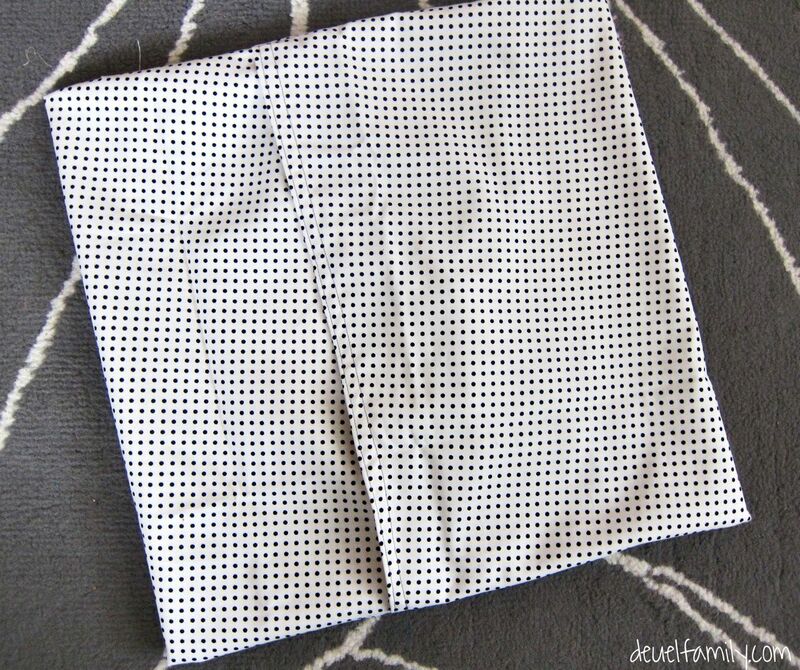 I like to lay my pillow insert on top of the fabric to measure where I need to cut for the width of the pillow. I don’t measure with a ruler. I just leave enough seem allowance on either side of the pillow to sew. It is about half an inch, but I just eye-ball it. Pillows are so forgiving! 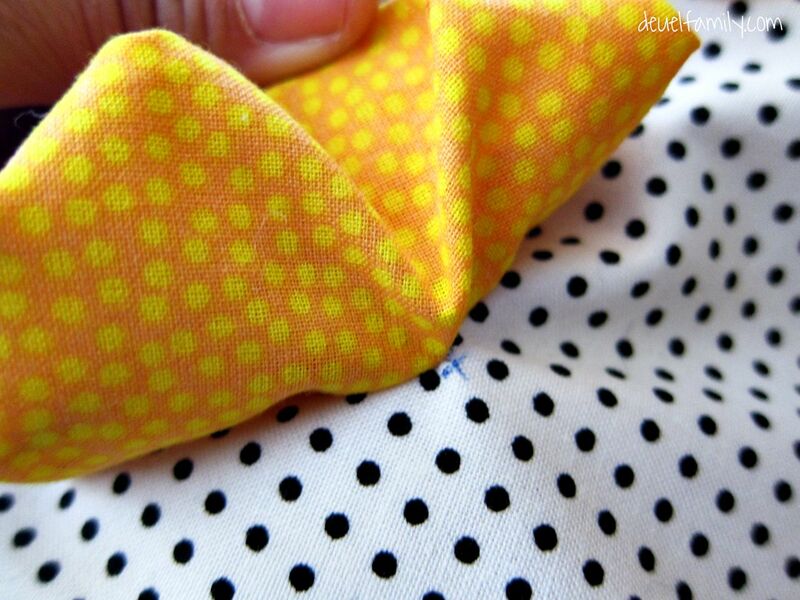 Before you fold your fabric to create the “envelope”, you want to hem the edge of the two fabrics. By doing this, it will look clean and “finished”. 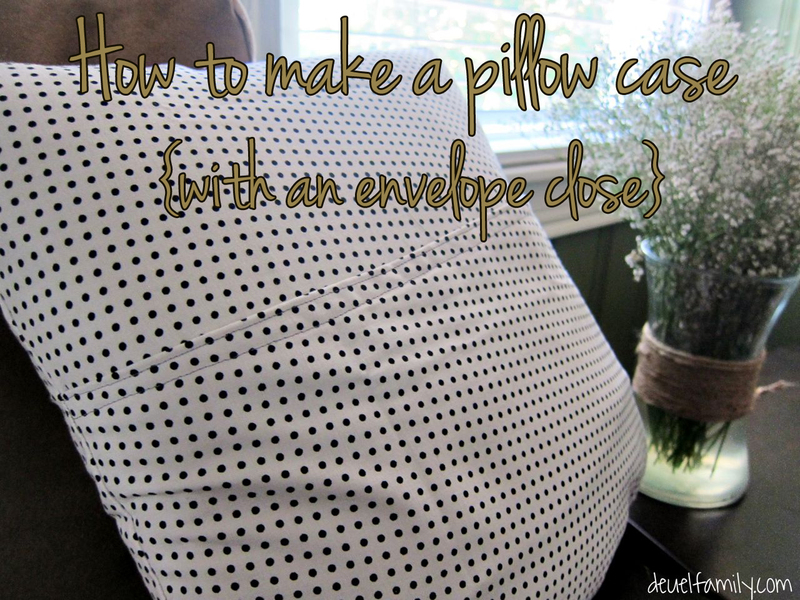 If your pillow is flipped around, you want that envelope opening to look “professional” and not the rough, frayed edge of the fabric. 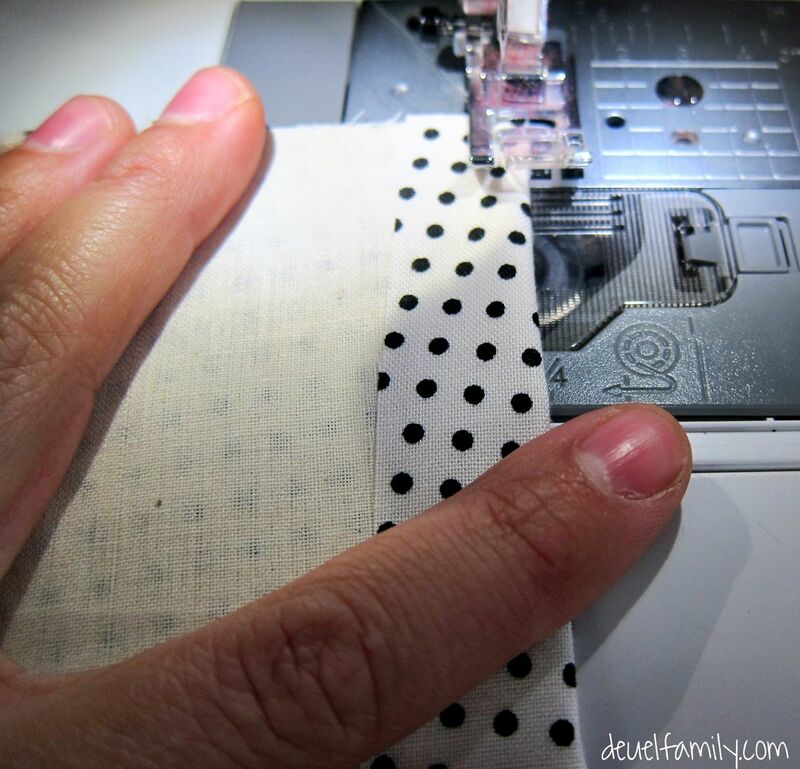 I eyeball about a half-inch seam and fold it as I sew down the imaginary line. I go back and sew another line on the fold as well. 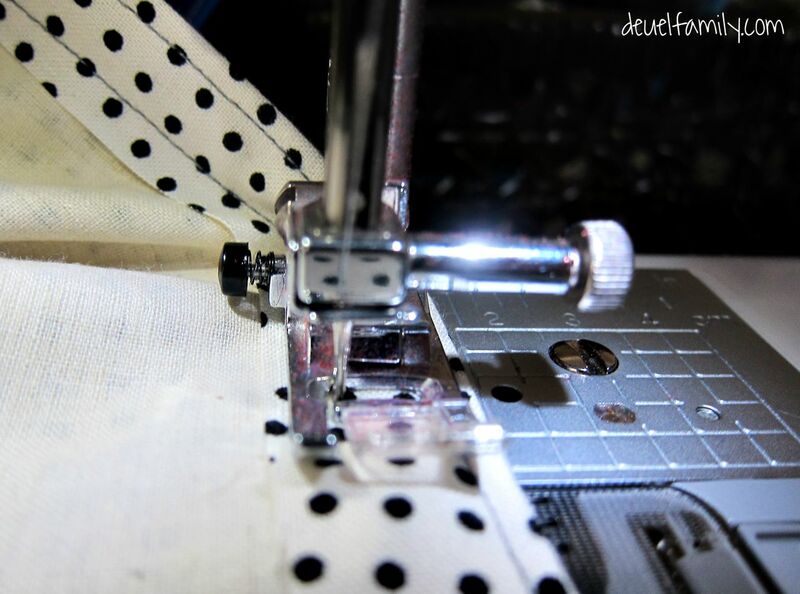 I like (as you can see behind my machine’s sewing foot) the look of two lines to edge the seam. I am too lazy to change out the foot on my machine that would allow these two lines to happen at the same time. 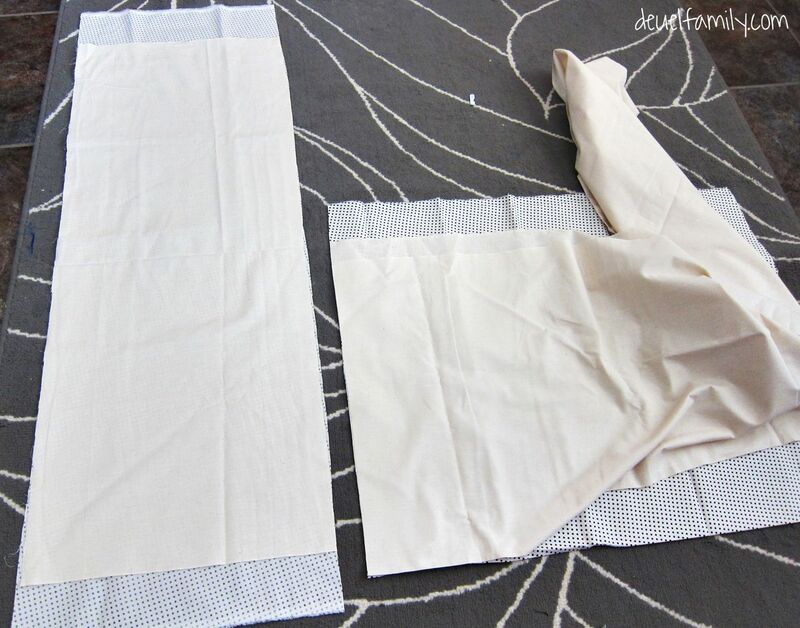 Once you have sewn the edge, fold your fabric up the size of the pillow case. I play with this step to get my “opening” on the back either in the middle or top of the case. I like to change-up its placement. I’m sorry I didn’t take more pictures of this step, but you seriously fold the top (seemed end) over. (You should be looking at the liner). It should meet about half way down your length of fabric. You then fold the other end up to overlap the first end by at least three inches. You don’t want the envelope to “open” and show your insert, so be sure to make it a good overlap. 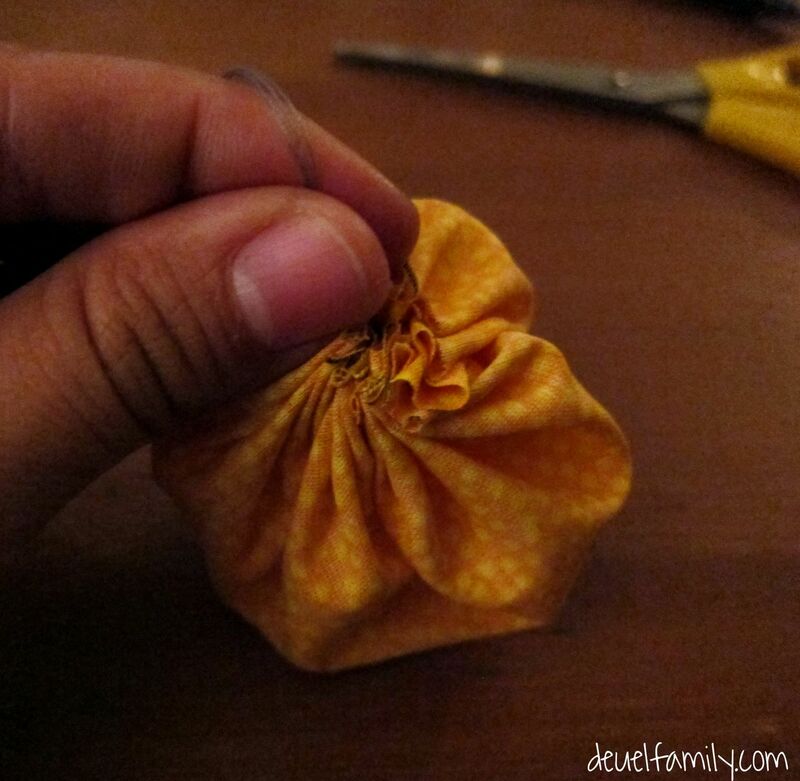 Once you have a good envelope fold, pin the fabrics together. Now, sew along the pinned “imaginary” lines. 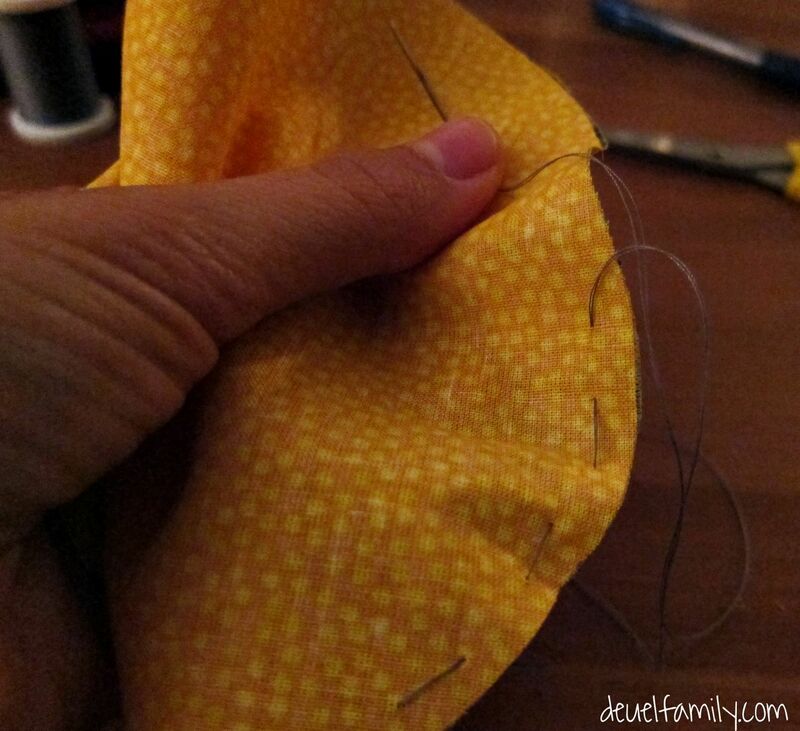 After you have sewn both lines, turn it right side out. You have an envelope pillow case! Congratulations! 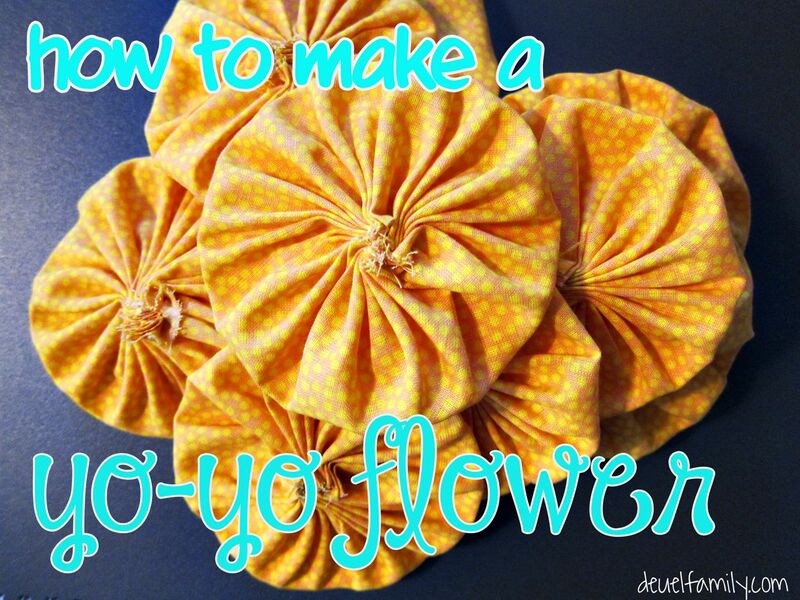 Now, you just need to sew on your yo-yo flowers. I laid my flowers out on the case to figure out their placements. I then marked a small “x” on the pillow case in what seemed like the middle of the yo-yo flowers. I simply sewed each yo-yo onto an “x”, and it was then complete! Stuff your insert inside and enjoy it! I loved the way it turned out! I hope you feel like you can give this project a try! If you have any questions, I would love to hear from you and see if I can help. 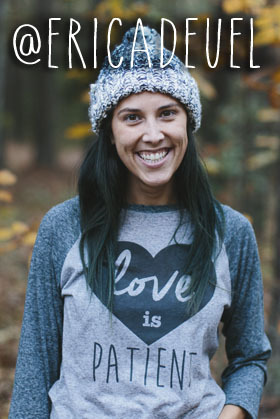 Thank you so much for reading this week’s Friday Project Spotlight! I have some really exciting news that I can’t wait to share with all of you! Well, it is exciting to me. Please check back Monday for my great reveal! I linked this project up at Miss Information.